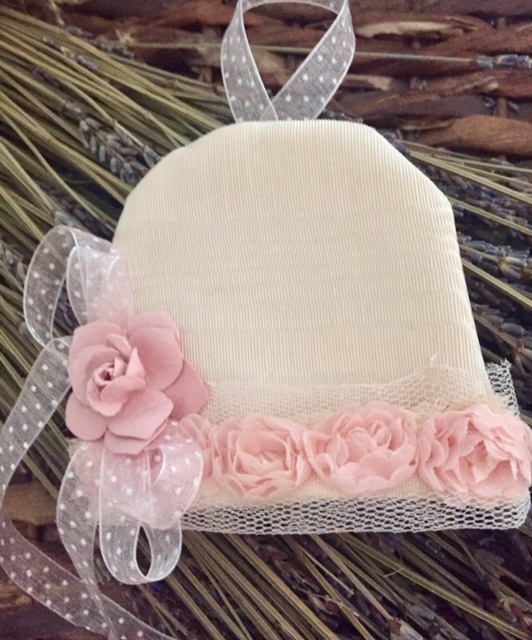 This baby girl bonnet is made with a pale pink moire fabric and trimmed with dainty organdy and tulle flowers with a pink/white polka dot ribbon. Fresh lavender is tucked inside. This would look sweet hanging in baby's room. A nice token for your guests to take home. A ribbon for hanging! This can be made in other fabrics, colors, etc. Please email or contact me.